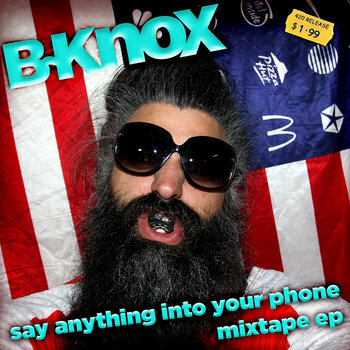 b-knox aka Baron Knoxburry is representing the random words with his ‘say anything into your phone mixtape ep’. Expect some cursing, obscenity and combine it with breakbeats, chainsawducks, and explorations in mental psychiatry. Normally hip-hop doesn’t turn me on, but when used and abused within the open minded functionality of experimental freedom of music, things do really get appetizing. Dunkelroin is such a strong musical statement on this fine album, combining a melodic retro groove and pulling it through the roof with some swing and a salty source of humor and a Justin Bieber’s beliebers referring end. Also the short lived ‘action jackson’ is massively impressive in tricking my reviewers fingers to call the dealer for some huff and puff material, it isn’t a necessity when listening to these tunes, but it might help enlighten the complete music session. We are not the only one asking deep questions as in ‘bling dem packs’ also B-Knox himself also is down on his knees asking important things like ‘who am I?’ and wondering what the hell he is doing.. The tracks are a bit like little those tiny toys in a kinder surprise egg, you know it won’t last forever and yet you feel happy when opening the plastic thingy. In the case of those eggs it must be a rushed highness triggered by munching the milky chocolate, but with this release it’s simply the presence of ‘this fakkking guy’ named Baron Knoxburry whose highness is pretty much brought over through the advanced high vibes.. In any case, it is clear that the artist’s message is clear; sing whatever in your phone’ and you might end up with a whacky release you could upload for other people their joy and entertainment. This entry was posted in Uncategorized and tagged alternative, Austin, autorap, Breakcore, breaks, chiptune, comedy, hip-hop, nerdcore, stoner, synth, synthpop, vocal, wonky. Bookmark the permalink.